These large-cap companies have exhibited impressive performances on the stock market over the past week, month, year and three years. These companies are expected to continue to do so as analysts forecast a huge upside in their earnings annual growth rate over the next five years. In addition, these stocks received very high ratings from GuruFocus for financial strength as well as profitability and growth. Warning! GuruFocus has detected 5 Warning Sign with EW. Click here to check it out. Edwards Lifesciences Corp. (EW) has gained 9% over the last week, 8% over the past month, 25% so far this year, 35% over the last 52 weeks and 122% over the past three years through March 18. The company doesn't pay dividends. Shares of the Irvine, California-based medical devices manufacturer closed at $190.89 per share on Monday for a market capitalization of $39.66 billion. The stock has a price-earnings ratio of 56.48 versus an industry median of 30.17, a price-book ratio of 12.71 compared to an industry median of 3.06 and a price-sales ratio of 10.95 versus an industry median of 3.15. Edwards Lifesciences has a financial strength rating of 8 out of 10 and a profitability and growth rating of 9 out of 10. 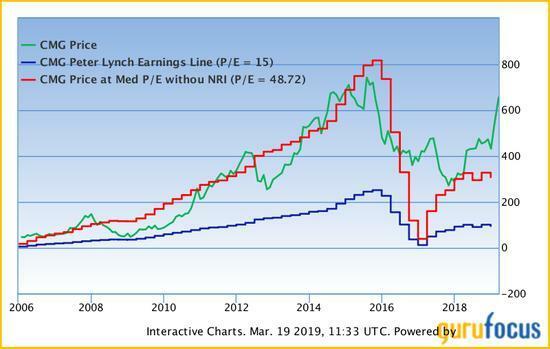 The Peter Lynch chart suggests the stock is not cheap. However, analysts predict earnings will grow at an average rate of 12% per annum over the next five years. Wall Street released an overweight recommendation rating on shares of Edwards Lifesciences, meaning analysts expect the stock to outperform either the industry or the overall market with an average target price of $183.64 per share. Chipotle Mexican Grill Inc. (CMG) has gained 4% over the last week, 10% over the past month, 52% year to date, 105% over the last 52 weeks and 44% over the past three years through March 18. The company doesn't pay dividends. Shares of the Newport Beach, California-based restaurant operator were trading around $655.80 per share on Monday for a market capitalization of $18.14 billion. The stock has a price-earnings ratio of 103.93 versus an industry median of 25.91, a price-sales ratio of 3.77 versus an industry median of 1.09 and a price-book ratio of 12.60 compared to an industry median of 3.03. Chipotle Mexican Grill has a financial strength rating of 10 out of 10 and a profitability and growth rating of 8 out of 10. 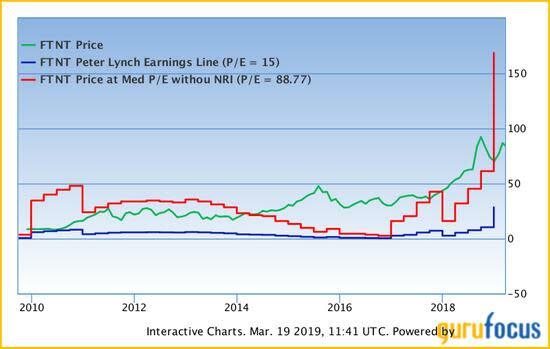 The Peter Lynch chart suggests the stock is not cheap. Analysts, however, forecast earnings will grow at an average annual rate of 24% over the next five years. Wall Street issued a hold recommendation rating on shares of Chipotle, with a price target of $554.38 per share. Fortinet Inc. (FTNT) has gained 3% over the last week, 1% over the past month, 20% year to date, 57% over the last 12 months and 194% over the past three years through March 18. The company doesn't pay dividends. Shares of the Sunnyvale, California-based provider of cybersecurity solutions were trading around $84.51 per share on Monday for a market capitalization of $14.42 billion. The stock has a price-earnings ratio of 44.48 versus an industry median of 24.79, a price-book ratio of 14.25 compared to an industry median of 2.93 and a price-sales ratio of 8.18 versus an industry median of 2.86. Fortinet has a financial strength rating of 8 out of 10 and a profitability and growth rating of 9 out of 10. 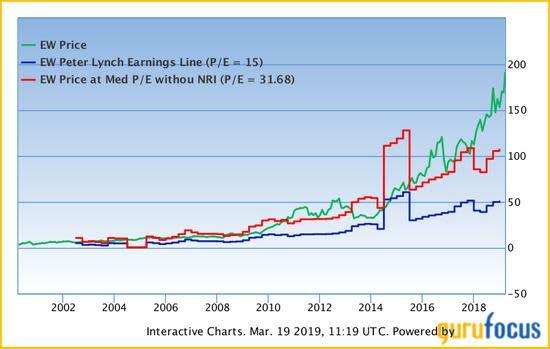 The Peter Lynch chart suggests the stock is overvalued even though the current share price is substantially below the price at median price-earnings without non-recurring items line. Further, analysts foresee 26.5% average annual growth in net earnings for the next five years. Wall Street issued a hold recommendation rating on shares of Fortinet, with an average target price of $87.04 per share.